Over one billion persons in the world are Hindus. We have wonderful friends right in our neighborhood who came to the US from India. 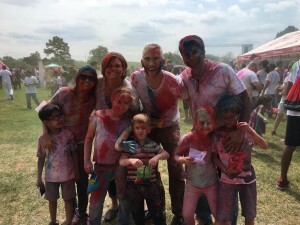 This past weekend we joined them at the Houston Holi. Holi means “colors” and that is what this festival is best known for: People throwing colored cornstarch at each other. It is great fun and like any other festival it has stage performances, vending booths and bounce houses for the kids. What makes it unique are the colors: They are everywhere, the air is filled with colorful dust, every square inch of clothing and skin is covered. Family, friends, and total strangers throw handfuls of color at each other recreating the entire rainbow. 1. Prahlad is a saintly boy who was challenged by the demoness Holika. After a lot of temptation Prahlad was supposed to be killed but through divine intervention death loses to life. Holi is the celebration of life overcoming death. 2. Krishna is an ancient deity that is usually depicted with dark skin. Eventually he married Radha, a goddess with “fair skin”. Holi is the celebration of color covering everyone’s face so the color of your skin does not separate person from person. Just like Easter, Holi is tied to the spring equinox and this season comes with life starting to spring, blooming with hope and bringing out more colors. I am going to crack open a wonderfully colored Easter egg now.